Upgrade means to make your life easier with concrete result. In other words, unless it is a system to improve your business, management system is worthless. We proved that ISO 50001 class energy management system improved company's business performance without putting concerns on certification. 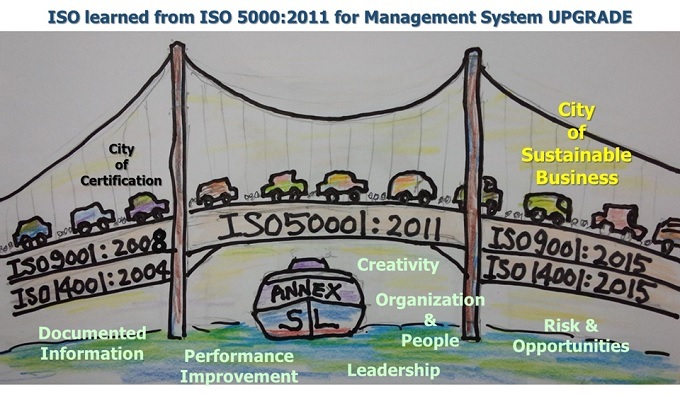 ISO organization must realized something about the management systems. "Is certification benefiting the operation of business operators?" "Isn't certification processes obstructing the real ISO mission? 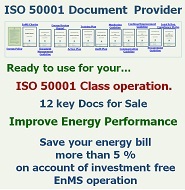 It is a management system guideline to continual improve perfomance regarding energy use in business outputs. This positive attitude, performance oriented and people centric guideline should sparked the ISO organization to upgrade certification centric management system such as ISO 9001 and ISO 14001. Upgrade means to make your organization's life easier with performance improvement result expected. For the ISO 9001:2015/ISO 14001:2015 upgrade, the essense is no longer putting attention in certification but to focus on the performance of business by managing operation through the key elements of quality and environmental that can affect the outcome of business performance. The system making continual performance improvement actions as part of business operation would ensure the organization to take the path of sustainable (Ability to sustain your business diversity and productivity on the basis of without having time limitation) business development..
ISO 9001:2015/ISO 14001:2015 upgrade would lose purpose if the certification body comes to knock on your door. Management system loses its effect when being rushed or being pressured. It must be consistent with the daily business activities, and the workforce should incorporate the system in their daily activities. Certification comes automatically if the organization practices self-motivated and effective quality and environmental management system having the purpose of continual performance improvement that can be measured and evaluated. The essence of continual performance improvement evaluated can only be appreciated by organization itself but no one else. With the upgrade, we are entering the era of "audit the third party auditors" when obtaining the certification.